As Europe marks the centenary of the outbreak of the First World War, a new exhibition of C. R. W. Nevinson’s prints is a bleak reminder of those dark days, writes Clare Walters. C. R. W. Nevinson (1889-1946) was an English artist who, although a pacifist, became an official war artist of the First World War in 1917. From 1909-12 Nevinson studied at the Slade School of Art, where he was a contemporary of Mark Gertler, Stanley Spencer, Paul Nash and Dora Carrington (elder sister of Noel Carrington, founder of Puffin Picture Books, see ‘Puffins on the plate’ in Eye 85). C. R. W. Nevinson, A Dawn, drypoint, 1914-16. 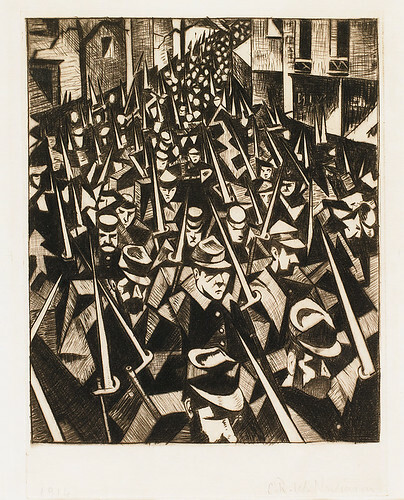 Top: C. R. W. Nevinson, After a German Retreat – Labour Battalion Making a Road through a Captured Village, lithograph, 1918. All images courtesy of Osborne Samuel. In March 1912 he attended the Futurist exhibition in London, where he met the founder of Futurism, Italian author Filippo Tommaso Marinetti. Later he joined Marinetti’s Futurist group in Paris and, like them, became interested in speed, technology and modern machinery. 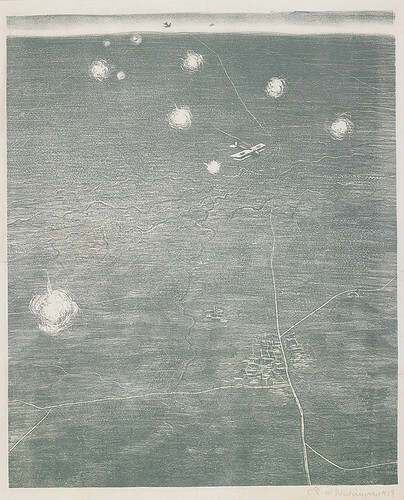 C. R. W. Nevinson, Nerves of an Army, drypoint, 1918. When war broke out in 1914, Nevinson joined the Friend’s Ambulance Unit. Here, and subsequently in the Royal Army Medical Corps, he witnessed the enormous cost of the tragedy unfolding before him. A sense of the horror is reflected in his work, which uses techniques he had developed with the Futurists to show a bleak, mechanised, brutal view of warfare at the beginning of the twentieth century. 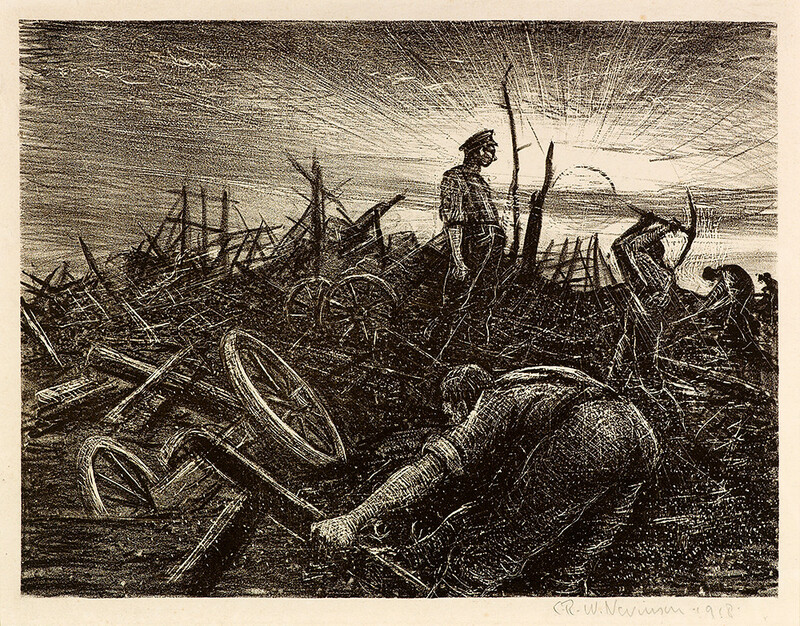 C. R. W. Nevinson, Returning to the Trenches, drypoint, 1916. In January 1916 he was invalided out of the army, due to rheumatic fever. But later that year his one-man exhibition in London caught the eye of the British chief war propagandist, Charles Masterman, who asked Nevinson to return to the Front as a war artist. 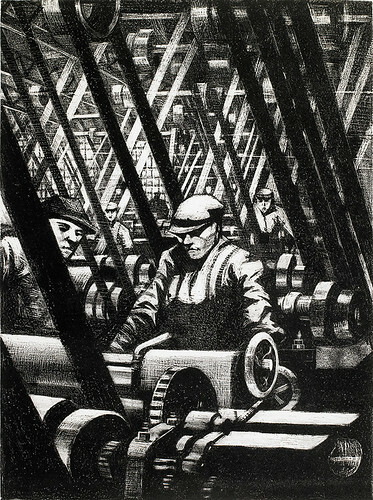 C. R. W. Nevinson, Making the Engine, lithograph, 1917. 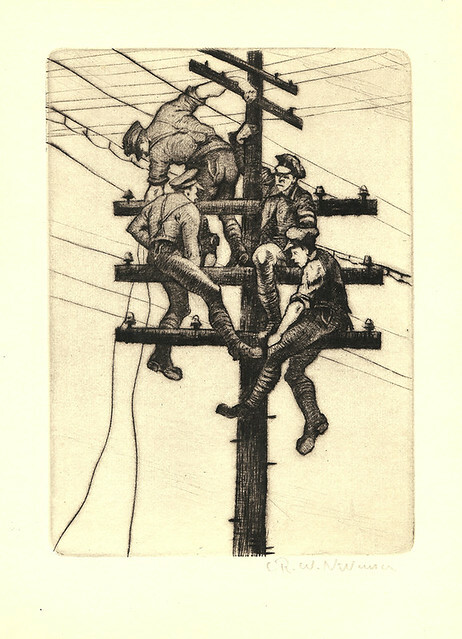 C. R. W. Nevinson, Over the Lines, lithograph, 1918. Back in France, Nevinson became the first artist to make drawings from the air, showing amazing images of early aerial warfare (above). These and other war pictures led to a second, hugely successful London exhibition in 1918. 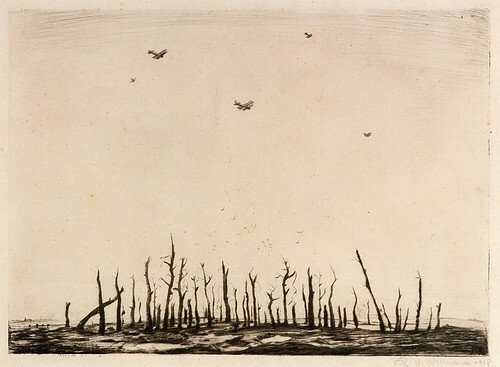 C. R. W. Nevinson, That Cursed Wood, 1918, drypoint. 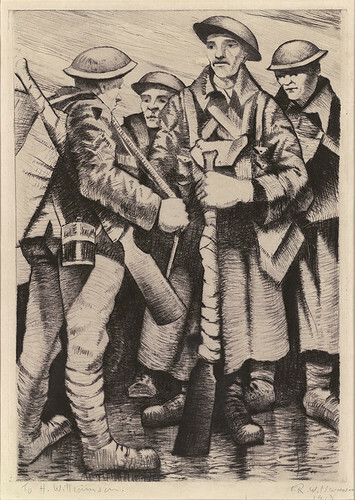 C. R. W. Nevinson, A Group of Soldiers, drypoint, 1917. 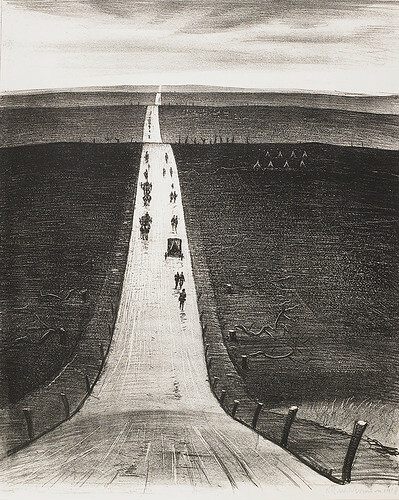 C. R. W. Nevinson, The Road from Arras to Bapaume, lithograph, 1918. After the war Nevinson renounced Futurism and began creating images of architecture and cityscapes. These featured both the London and Paris he knew well, and also New York, which he visited for the first time in 1919. In October of that year the American print dealer Frederick Keppel put on Nevinson’s first New York show. 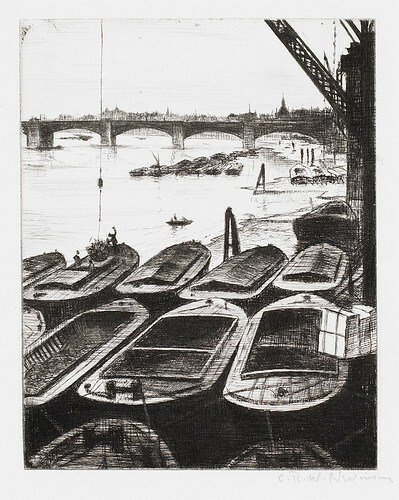 C. R. W. Nevinson, The Pool of London (also known as Swing End Barges), drypoint, ca. 1920. 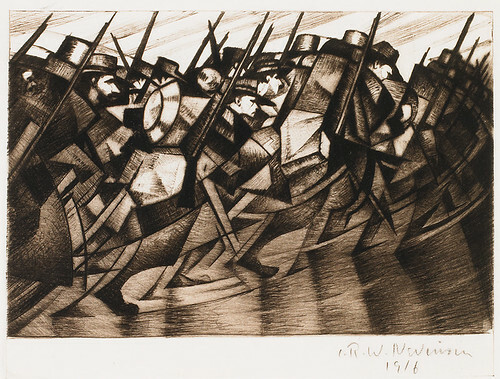 Subsequently Nevinson’s work became more conventional, but between 1916 and 1933 he made a total of 148 prints. This exhibition shows a comprehensive selection of these powerful images. The exhibition also coincides with the publication C. R. W. Nevinson – The Complete Prints by Dr Jonathan Black (Lund Humphries & Osborne Samuel Gallery, £150). 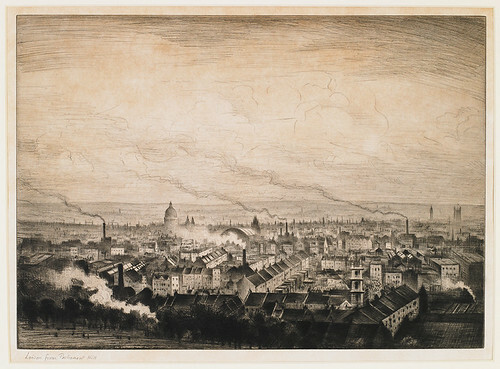 C. R. W. Nevinson, London from Parliament Hill, ca. 1923, drypoint.